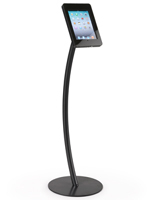 This iPad mini touchscreen holder is designed for interactive marketing in commercial settings such as malls and stores. 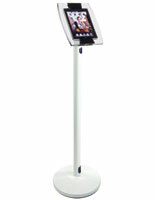 The acrylic enclosure tilts and rotates for optimal viewing horizontally and vertically. 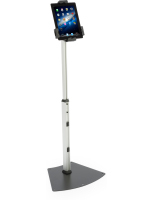 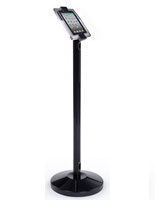 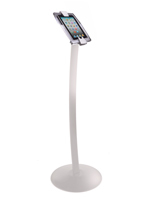 This adjustable Apple® iPad floor stand with telescoping design measures 38" to 66" tall. 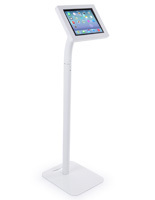 This touchscreen holder is one of our popular tablet accessories that enables advertising presentations and convenient customer browsing. This advertising display can be charged inside its enclosure during use, so there are no usage interuptions. 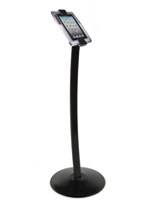 This holder has a cover that reveals or hides the "home" button depending on store owner goals to protect data when used in public venues.